The single biggest preoccupation of senior management of any listed company is its institutional investors. CEOs and CFOs on average spend around 40% of their time dealing with this group, and the implicit goal of most management teams is to maximise share price. Yet the true influences behind movements in share price are poorly understood, and thus many companies do not do a good job of managing their investors. 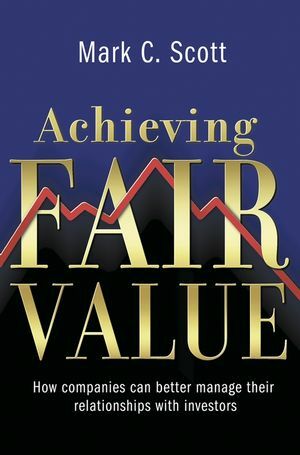 Achieving Fair Value provides the appropriate strategy tools and techniques for management to ensure that their business is valued in a way that accurately reflects its fundamental, sustainable worth for the long term. It is a timely and practical contribution to a topic that should be high on the agenda of any senior management team. Mark C. Scott graduated with a First Class Honours Degree from Christ Church College, Oxford. He completed an M.Phil at Cambridge University and an MBA at Harvard Business School. He originally trained as a management consultant, working for Michael Porter at Monitor Company, and subsequently joined WPP Group plc, the world’s largest marketing services group. In 1998 Mark left WPP to help form Lighthouse Global Network, a start-up marketing services group acquired in 2000 by Cordiant Communications in a deal valued at $600m. Mark is a director of the Ashridge Strategic Management Centre, and continues to be involved in the consolidation of professional services firms. He is the author of four books with John Wiley & Sons including The Professional Service Firm and Value Drivers. What should management be trying to achieve on behalf of shareholders? Why do markets fail to identify fair value? Why do fund managers behave as they do and what can management do about it? How do you know when your company is fairly valued?